The cheap and beautiful hotel near My Khe beach, Da Nang city is always an attractive choice for visitors in the country or even everyone oround the world. 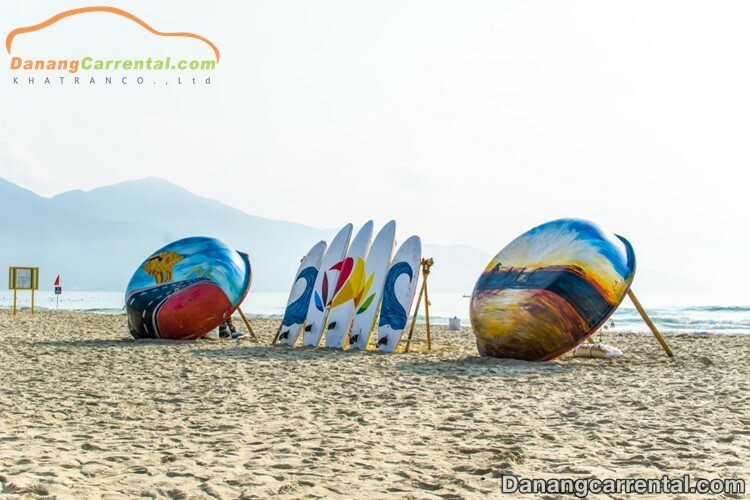 Now, Kha Tran car rental would like to introduce a few cheap, beautiful and high quality hotels in Da Nang which are near My Khe beach in order to help you feel easier to choose the ideal accommodation when traveling to Da Nang city. Almost of the domestic and foreign tourists who travel to Da Nang city, also want to choose the cheap hotels near My Khe beach to be more convenient for visiting this beautiful coastal city. 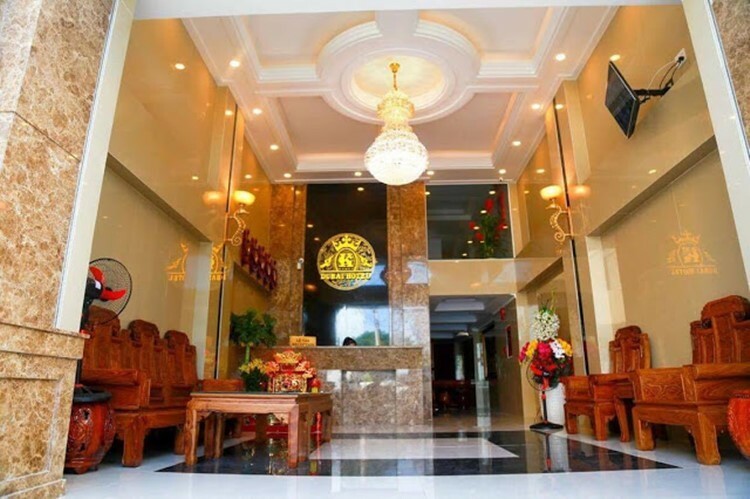 Looking for a hotel in Da Nang city is not difficult, but in order to find a convenient Da Nang hotel near My Khe beach with cheap price and good quality service, you need to know in advance. Choose a hotel with good location and convenient with Da Nang tourist sites and famous eating – places. When planning to travel to My Khe beach, you should contact the hotels to book the rooms early in order to have rooms with beautiful view or avoid the price increases as well as not having availbale rooms when the date is too close. Da Nang is knownas the city of sea tourism. The most beautiful and famous beach is My Khe, which has been voted to be one of the six most attractive beaches on the planet by America’s leading business magazine – Forbes. Therefore, there are many tourist sites are strongly invested around the area of My Khe beach. Guests will enjoy watching the beautiful beach with white sand stretch and clear blue water. Seafood here is also very fresh and cheaper than other beaches. 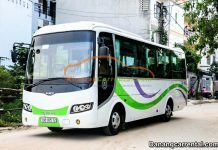 Referring to the cheap Da Nang hotels near My Khe beach which have a extremely convenient location for travelling to Da Nang city as well as the perfect service to enjoy the full Danang tourism. The hotel is located near My Khe beach, about 700 meters from the city center from the direction of Tran Thi Ly bridge to the beach. It is an ideal place for tourists to Da Nang city. The hotel is at a distance of 100 meters from the beach, so only 5 minutes walk you can see beautiful beach on the top 6 of the planet. The area around the hotel is always crowded and bustling with music festival each night. There is the pigeon area for couples who want to take their romantic and beautiful wedding photographs, too. Because the hotel is also newly built, so the rooms are very clean, luxurious and full facilities such as elevator, hot water, hair dryer, refrigerator, air conditioning, TV, telephone, cable TV, internet, … Staying at the Dubai hotel, people will get a fun and meaningful holiday. Dubai Hotel has high quality services with extremely professional, thoughtful and enthusiastic staffs. Guests of the hotel will also be provided with maps of all destinations in Da Nang city. Champa hotel is a budget hotel near My Khe beach and the city center. It is also very close to food street. A place can not be more ideal for tourists when travelling to Da Nang city. The beach area in front of the hotel is also the most crowded and beautiful entertainment on My Khe beach. The hotel opened in 2016 with a very modern design, beautiful furnitures and amenities that will please all of the visitors. 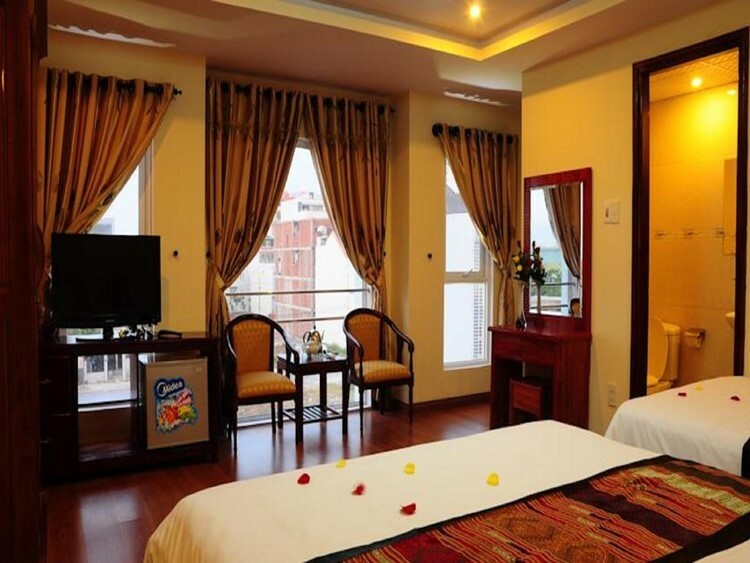 The Champa hotel will be very convenient for tourists to visit famous tourist spots in Da Nang city such as: Son Tra peninsula, Ngu Hanh Son mountain, Hoi An ancient town, Ba Na hills and bridges along the Han river. It is quite close to the airport and train station for travelers too. Especially, the staffs at Champa hotel are professionally trained, so they always recommend the visitors to the fun places, delicious restaurant and enthusiastic and cost-effective amusement places. When people relax in hotels near My Khe beach, it is very convenient to see the legendary bridges such as Dragon bridge, Han river bridge, Love bridge, Tran Thi Ly bridge, Carp turning into Dragon statue, etc. Besides that, you can visit the famous tourist sites in Da Nang city near the hotels such as Son Tra peninsula, Ngu Hanh Son mountain, Non Nuoc, Hoi An ancient town and so on. 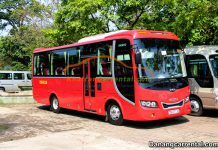 Kha Tran car rental hope you will be satisfied with the cheap hotels near the My Khe beach in Da Nang city that we introduced above. 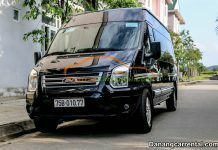 You can also contact Kha Tran car rental in Da Nang city to experience the most attentive services to help your journey with your own family more comfortable with the cost savings in Da Nang city. We will help you to make a perfect schedule with attractive Da Nang tourist attractions which has good quality accommodation rates. In addition, you can ask for our help to book rooms reservations quickly and choose car rental services. 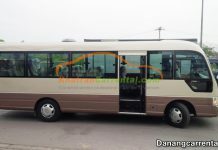 The high quality tour car will give you the best experience during your journey. If you have any questions or need further advice, please contact via hotline Ms Katharine: (+84) 91 651 02 01 – (+84) 34 797 6789.